If you’re a new motorcyclist or often find yourself driving behind one, you may wonder about the different hand signals used and want to know what they mean. For new motorcyclists or those traveling in groups, it’s important to know what these hand signals mean so that you can communicate properly while driving. How do you signal a left turn? How do you let someone know that you’re about to stop? How do you tell your motorcycle group that they need to get in single file? All of those motorcycle hand signals and more can be found on this chart. All motorcycles are supposed to be equipped with a lamp-type turn signal system, but just like with a car or truck these lights can go out. In a siltation like this, these hand signals are even more important. If you drive any other type of automobile, it’s still important to know some of these motorcycle hand signals. If you’re driving behind a motorcyclist without working lights, you should know if they’re signaling a left or right turn . Even signals like “hazard in roadway,” “turn signal on,” and “cops ahead” can really be helpful. Is there a hand signal that you often see motorcyclists using? If you’ve found this infographic helpful, be sure to share the knowledge. 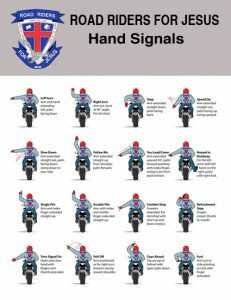 Click on image to downlaod “Motorcycle Hand Signals Chart”.